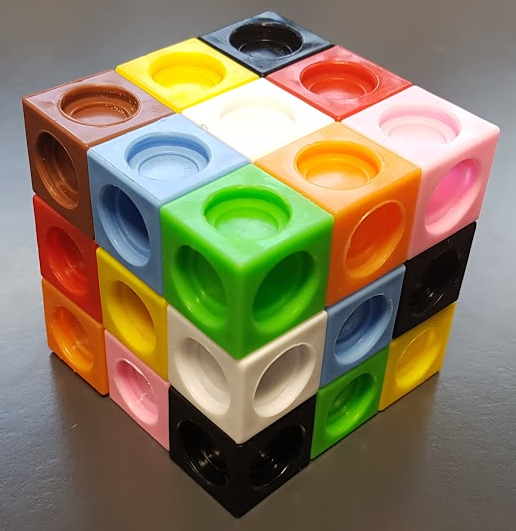 If you have 27 small cubes, 3 each of nine colours, can you make a 3 by 3 by 3 cube so that each face of the bigger cube contains one of every colour? In the picture, the top face and the left face have one of each colour. Unfortunately the third face has two greens, two blacks, no reds and no browns, so this is not a valid solution. You might like to explore this problem using cubes. If you don't have any cubes, you could record your work on squared paper by drawing and colouring each layer, or use the interactivity below. Choose a colour, and click on a square on the left to colour a cube on the right. When you complete a face correctly, a "tick" will appear. Cubes & cuboids. Interactivities. Games. Practical Activity. Resilient. Visualising. Interlocking cubes. Logo. Programming. 2D representations of 3D shapes.